Tomorrow I will have them removed in a laparoscopic surgery. Our friend Dr. Mike Milam will be performing the surgery at Norton Suburban Hospital. We need to be at the hospital at 5:30am and I am the first surgery of the day. Many thanks to our neighbor Paulette for walking over at 5:30 to get the kids off to school and Lauren for picking them up after school. When all goes well, I will be home tomorrow afternoon. I’m hopeful this will be a big step toward stopping this cancer from progressing. We don’t know how my body will respond. Only time will tell, but I have to believe by removing the estrogen that feeds it – we slow it significantly. I have also made some major changes to my diet with the help of an integrative nutritionist. Basically i am just eating really “smart” as Jay would say. If it grows from the ground in a natural way (no chemicals) – I eat it. If it has been altered or modified it’s out. I have cut out all refined sugar (yes, even oatmeal scotchies) & limit my alcohol significantly. (I have an entire wine cooler full of wine from our napa trip… I can’t imagine not tasting those wines again.) I don’t know if this will make a difference… there are different opinions out there that’s for sure. But, I figure it can’t hurt. I feel like I am doing something… I feel in control of my diet and that helps me feel some ownership of my health. I drink more vegetables for breakfast than I used to eat all day! I just have to know I am doing everything I can to make my body as strong as I can to fight this for as long as I can. I’m also walking about 4 miles a day and feeling pretty good. I can’t begin to respond to all the cards, gifts, flowers and other nice things people have sent us. Thank you all! Thank you for your prayers and encouragement. We feel it. We are taking it one day at a time. Finding laughter & joy in the midst of despair and learning how to live in this new normal… hopefully for a long time! I will have Julie update the caring bridge page tomorrow when I am out of surgery. One of the biggest things I have had to do over the past 6 weeks is accept the reality that I have stage IV cancer. Accept the reality that doctors don’t know how to cure this disease and don’t necessarily agree how to treat it. Accept the idea that every person is different and every cancer cell is different and we simply don’t know what mine will do. I learned to embrace my current situation. In doing so, I have found an immense amount of peace. I love my life and the laughter it holds, the joys, the adventure and the love. Now I also embrace this new reality of stage IV cancer. Am I giving up, HECK NO! I am living life with this diagnosis. I read this morning that “Life doesn’t start when this, that or the other thing is resolved. Life is now and it is great.” Isn’t that the truth. I recognize there isn’t a “magic pill” to make my cancer go away. I’m sure oncologists aren’t holding out against wheat grass because they just love to give people chemo. But, at the same time I simply can’t (CAN NOT) believe it when doctors tell me “you are doing all the right things Lara. You exercise, eat right, get plenty of rest, stay positive, don’t smoke, etc… Just keep doing what you are doing.” Hello! Clearly, that isn’t working for me. 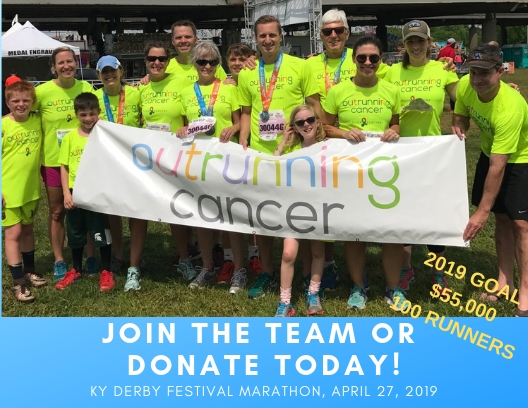 I am a person of action and I have to believe there are things I can do that can help make my body stronger and better equipped to fight off this cancer. I have to believe I am doing SOMETHING that helps me live as long as possible. I can’t have any regrets. So, I’m on a wellness journey. I’m researching, learning, networking – trying to understand what I can do to strengthen my body, mind and spirit. I know my spirit is already so much stronger as I embrace this cancer. I believe I can make my body stronger with even healthier foods. I’m like Norm on Cheers when I go into the Life Bar. “Hi Lara!” and I pull up my favorite bar stool. Who knows if any of this will work… If I can stop my cancer from growing or spreading. What I do know is I have to feel like I am in control of something and that my actions are helping to save my life. I won’t go into detail about all the things that are out there. I hopefully won’t become so far flung in my ideas that no one wants to have us over for dinner. I am connecting with people who are living life to the fullest while also revamping the way they eat and face their treatments. There are some amazing women with the same ideas that I have and I’m excited to have them by my side on this journey. Today is a great day. I feel empowered to make my body healthy. I am excited to watch our boys play basketball and just spend time together as a family. I will go for a long walk and feel the strength returning to my bones and muscles. And I will live this glorious day with joy in my heart, cancer in my bones and hope in in my spirit. Right now, I am proud beyond words that Hope Scarves is at the C4YW (Conference for Young Women) in Orlando this weekend. I would much rather be there representing Hope Scarves than here figuring out our treatment plan. But, the fact that since we launched our organization at C4YW two years ago Hope Scarves has grown to a point where we have two staff people who can be there representing “my little idea” is amazing to me. For those who don’t know this – Hope Scarves essentially started at the C4YW in 2009 when I attended the conference as a survivor with my mom. I packed some of the scarves Kelley had sent me with the intention of finding someone there who could wear them. There I met Roberta and we laughed as I showed her how to wear a scarf. Roberta and her friend Jen (Who was at the conference) joined us for the Annual Celebration of Hope event for Hope Scarves this past fall. Roberta reminded me that at lunch in 2009 I told her my idea for Hope Scarves. I had forgotten that I had shared this little plan that long ago… I put my heart into this organization and I am so honored to see it grow and be so widely supported. It is essentially my “baby.” When we moved to Louisville I had two goals – to start Hope Scarves and adopt a baby. We realized we couldn’t do both so decided we would get Hope Scarves up and running and then find a way to expand our family through adoption. Life has taken us down a different path then adopting a child. But, really Hope Scarves is my “baby.” I’ve nurtured it and watched it grow. It has given me more than I could ever explain and it has taught me so much about who I am. Now, I’ve had to kind of let it spread it’s wings… but I’m not letting it go! I’m more determined then ever to put as much of myself into the organization as possible. I’m really excited about sharing my story and the story of Hope Scarves with a broader audience. I am looking forward to the opportunity to speak to who ever will listen (ideally someone like Ellen or Robin Roberts…) and tell them about Hope Scarves. Please spread the word about our organization. If you know a survivor – ask her to share her encouragement as a story donor. If you know a fighter – please send her a scarf. If you would like to make a donation please support our organization. You can do all these things on our website – www.hopescarves.org Please like us on facebook and keep up with all our fun. Please leave a comment if you have specific questions or ideas. I also want to thank all the people who helped get Hope Scarves ready for the conference. All the volunteers who made bracelets, tied bows, prepared supplies, to my friend Gelia who made 100 handmade “hope squares” for survivors who share their story, for Lauren for organizing lots of details. And most of all to our two part time, but full hearted staff members who are in Orlando (could be worse!) this weekend representing Hope Scarves. I am so honored to have Amy Keller and Erica Bricking representing me and Hope Scarves. I have made a goal that next year I WILL be at the conference and hopefully I will have the opportunity to be a speaker and share the story of Hope Scarves and how it came to be through the conference and the help of so many amazing young women fighting breast cancer and living life to the fullest. You know I am feeling better when I am back to sharing some Hope! I’m happy when I talk about Hope Scarves. So, thanks for letting me tell you about it! Tonight at dinner we made a simple toast. “To today” we said. I am working really hard at finding peace in my body, mind and spirit. I can’t say I made it through the day without crying and feeling overwhelmed. But, I can say that I laughed and that felt really good. I started my day with yoga and quiet time on my own to prepare for what the day might hold. Then, I walked with my dear friend DJ on a route we used to run after dropping off our kiddos at school. (and I will run again!) It felt so good to be out in the fresh air and feel my blood pumping. Then we bellied up to the “Life Bar” for a wheatgrass shot and a couple smoothies. 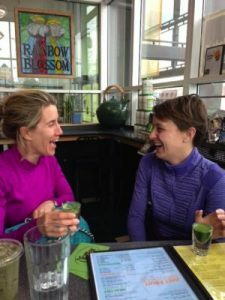 I’ve never been much of a shot girl (I much prefer a nice glass of cabernet or a micro brew beer) – can’t say wheatgrass is much better than Jager,,, but I’m told it is super good for you. So, bottoms up! 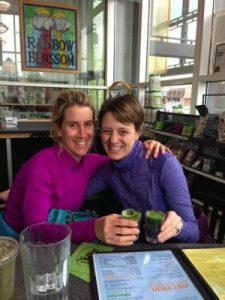 I’ve enjoyed talking with the folks at the Life Bar about all the ideas behind eating a raw and whole food diet. I’m not saying it’s the “magic pill” that will make my cancer disappear. But, I am a person of action and I recognize I need to be doing something to make my body stronger and healthier to fight off these damn cancer cells. DJ dropped me off at the Hope Scarves office and I spent several hours packing up suitcases and getting Amy and Erica ready for the C4YW (Conference for young women) in Orlando this weekend. Hope Scarves debuted our organization at this conference 2 years ago (our website literally went live as we handed out our brochures to young women). It was really hard for me to send my little “baby” off without me. But, I am also so excited that the organization has grown this much in two years and that we have two amazing women on staff to represent the mission and my dreams. I am not going to miss next year! Maybe Hope Scarves can even be a workshop or I can be a speaker! (hint, hint people of influence) Then, I mailed this weeks scarves. 13 scarves headed across the country to women facing different types of cancer, struggling to find hope within their diagnosis. My hope is that when they get their hope scarf they feel the encouragement and determination of those that have walked this path before them and they feel hopeful. Even if it is for just a moment. Hope is an amazing gift. Just as I was heading home, exhausted but proud of my big day. I got a call from U of L James Graham Brown Cancer Center that they had reviewed my case at the tumor board and Dr. Riley had room in her schedule to see me today if I could come in. So, of course I went, anxious to get input from another doctor highly regarded in the breast cancer world. Turns out Dr. Beth Riley and I know each other – our kids go to the same school. We share many mutual friends. She was kind, sensitive and straight forward with her approach to my diagnosis. Of course, she didn’t really offer any different information than the other doctors. How my tumor will react to treatment is uncertain. But, she agreed I need to hang on for science. There are more drugs coming out to fight metastatic disease and hormone therapy has a lot of promise to look at targeting treatment to each individual person. She thinks I should have my ovaries removed and also consider a hysterectomy. The hard part is we just don’t know what my tumor or other cancer cells will do. But, we can hope. She absolutely agreed with me on that. For that, I am thankful. Someday I hope I can speak to a group of med students and share this experience. Just let them know how powerful their words can be and how deeply a little compassion goes when you look at a patient as a whole person- body, mind and spirit. So, now I sit here reflecting on this day. Thinking about how my cancer hasn’t changed from a couple days ago, but how much stronger I feel. How much more capable I am to fight. It still hurts to look at my children and husband and think about the future. It is still hard to listen to friend’s talk about their family ski trips over Presidents Day weekend when our life is so off track. But, I have today. So do you. Each day is a gift. Embrace it with your body, mind and spirit.